VULII is designed to contribute directly to Vietnam's national goal of increasing the quality of higher education while strengthening human and institutional capacity to contribute to Vietnam’s economic growth. VULII uses an integrated approach — involving academic leadership from rectors to academic program leaders and senior faculty, in conjunction with quality assurance professional staff — to foster systemic change across institutions. It is a three year project, that began in 2012. VULII provides educational capacity-building and training workshops and support for multiple levels within the Vietnamese educational system, ranging from ministry officials and university rectors to mid-level administrators, academic and professional staff and engineering program faculty leaders who are preparing the next generation of the engineering workforce. Strategic planning and implementation at the institutional level requires significant change within all relevant parts of the organization, so VULII focuses on multiple levels of the various Ministries and academic institutions. This integrated approach, involving leadership at the highest levels in conjunction with academic program leaders and quality assurance professional at the delivery level, is the best way to influence systemic change across institutions and across the tertiary education sector in Vietnam. In the second year of the VULII project, a project emphasis on academic programs gaining international recognition has developed. This work has focused on workshops and coaching sessions focused on preparation and development of continuous improvement processes for academic programs. Such quality improvement systems are essential to successful preparation for either AUN-QA or ABET accreditation. After the VULII engagement, the eight universities are expected to serve as national examples for higher educational reform. In addition, other Vietnamese universities are welcome to join some or all of VULII components, but at their own cost. Rectors and vice-rectors learn to develop comprehensive institutional strategic plans and are exposed to state-of-the-art higher education administration leadership and management models to implement new strategic plans. Financial planning and innovative revenue enhancement mechanisms are adapted to the Vietnamese system to help enable institutional transformation. Deans and vice-deans experience and learn data-driven-decision making models, personal leadership techniques, academic management best practices and extensive exploration of program quality improvement mechanisms via lenses of accreditation. Deans are focused on using these tools towards improved student and faculty pipeline development and diversity, and development and implementation of institutional strategic plans at the program level to further national educational goals. University leaders, operating in an increasingly autonomous manner, need accurate, targeted data to enable better decisions. The project provides targeted professional development of quality assurance directors and staff in support of their newly evolving roles within institutional research, planning and support of academic program leaders. One focus is helping quality assurance staff assume their key role in successful implementation of continuous improvement systems central to accreditation and academic program improvement. Project resources are focused on helping rectors and deans lead institutional change strategies and create infrastructure for continued enhancement of faculty and curriculum. 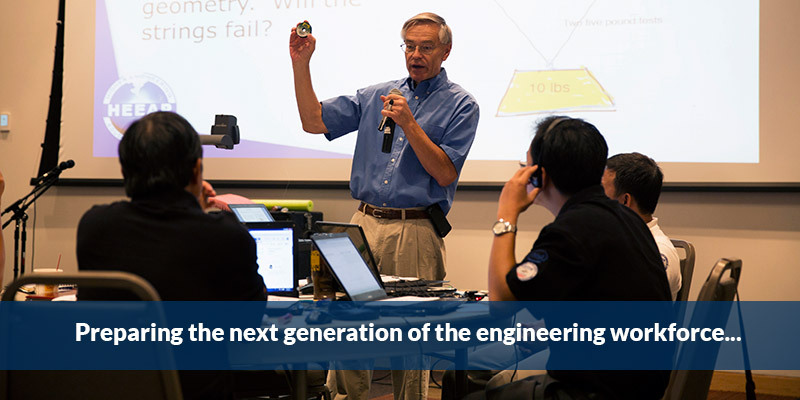 Mechanisms for driving such change include implementing quality systems necessary for accreditation and planning for a Center of Excellence in Engineering Education. The VULII project intends to help HEEAP institutions and leaders achieve sustainable efforts in program improvement via best practices and use of modern technology, such as distance learning networks.